China’s northeastern Liaoning Province launched a one-year “anti-terrorism special action” on June 1, tightening control of the sale and purchase of ingredients used in explosives. But among the restricted items are daily necessities like matches and lighters. 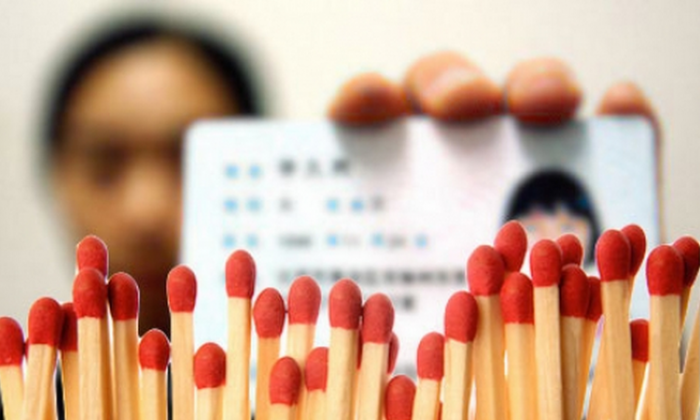 Public security officials in Liaoning announced that police will heavily control the purchase of matches, fluid lighters, gas, fireworks, and other explosive products, and that anyone who buys such items must register with their real names. After a flood of complaints about the need to register one’s name to buy matches or a cigarette lighter, the police appeared to back off. They said that ID would not be required for those items, but that “restrictions” will be put in place. They did not elaborate. Many Chinese people, writing on the Internet, were displeased at the prospect. “It won’t take very long before, once you light up a cigarette, you’ll be suspected as a ‘terrorist.’ [The authorities are] extremely nervous,” wrote the user @Beidaijin, on Sina Weibo. Similar rules have been implemented elsewhere in China, such as a requirement to use ID when buying gasoline or kitchen knives. Restrictions on the sale of kitchen knives was implemented in 2010 during the Shanghai World Expo and at other major events. The latest anti-terrorism campaign was triggered by a vehicle and bomb attack in Urumqi, the capital of northwestern Xinjiang Uyghur Autonomous Region, on May 22. The incident killed 39 and injured over 90 civilians, and was identified by the authorities as a terrorist attack. Party Central subsequently rolled out a nationwide anti-terrorism campaign. This has included the arrest of hundreds of alleged terror suspects. Over 200 people were arrested in Xinjiang on May 23, and 1,100 suspected were taken into custody in southwestern China’s Sichuan Province on May 23 to May 24, official reports say. Under the anti-terrorism campaign, Beijing authorities have deployed 100,000 “information officers” and 850,000 “safety volunteers” to inspect the city and surveil neighborhoods, beginning on May 30, according to the state-run Beijing Youth Daily. Their mission is to immediately report to the police any suspicious individuals or “incidents that may create social disorder.” The local Beijing government is calling the campaign a “social anti-corruption and stability maintenance intelligence system.” Each valuable clue or scrap of information is eligible for cash rewards ranging from 2 yuan to over 40,000 yuan (from 32 cents to $6,400), depending on its value. Perspective and ever suspicious, Chinese people have remarked that the movement smacks of the mass mobilization campaigns that were whipped up by Mao Zedong during the Great Cultural Revolution. During those years in the 1960s and 1970s, civilians were required to expose and criticize people who exhibited politically inadequate thought or behavior—a vague and ever-shifting standard that led to many innocent deaths and miscarriages of justice.